Several leading names from the international fresh produce business have scooped Superior Taste Awards at this year’s ceremony in Brussels. The prestigious honour, which is bestowed upon a basket of different food and drink products each year by the Belgium-based International Taste and Quality Institute, is based on blind tastings undertaken by judges from 15 of Europe’s most renowned culinary associations. 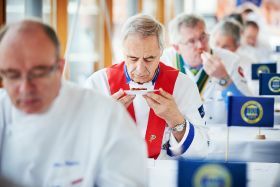 Among those securing the coveted honour this year for “exceptional taste and quality” was international soft fruit supplier BerryWorld, whose Twilight blueberries and GB96 strawberries each gained a two-star ranking, indicating a “remarkable product” with marks between 80 per cent and 90 per cent. Also recognised at this year’s event was Dole Japan’s Sweetio pineapple, which has now achieved an “exceptional” three-star rating for five years in a row. Canadian marketer Mastronardi was handed a total of three two-star awards for its Sugar Bombs grape tomatoes on the vine, Sprinkles tiny mighty tomatoes and Micro Cherry tomatoes. Spanish firm Frutas Montosa, meanwhile, repeated last year's success for its Native-branded guacamole by bagging a two-star award for its Native-branded mango sauce, a cold-pressed product made from 90 per cent fresh mango. Elsewhere, Belgian company Greenyard’s frozen foods division received two-star awards for its Pinguin-branded vegetable and cheese quinoa, as well as its Delhaize cauliflower rice. Among previous Superior Taste Award winners in the fresh fruit and vegetable industry is Fresh Del Monte, which in 2016 was presented with three awards for products in its Fresh Guac avocado dip range. Under a free licence, winners of the award are entitled to refer to it in their marketing for three years.